"Trends are not always trendy"
Has the Antarctic continent become significantly warmer in recent years? Are there any reliable, long-term temperature records available for this region? Do historical temperature records give us any indication of probable future temperature trends? Are the snow and ice deposits in Antarctica likely to melt and result in significant worldwide rises in sea level? Some of these questions are answered below. Please send me your comments. Long-term air temperature records at 13 stations (all polar research bases) in Antarctica have been extracted from the website of KNMI (Royal Dutch Meteorological Institute). This is all raw data (GHCN), without any adjustments ever having been made (as far as I am aware). Only stations with records over a period of at least 50 years, with largely complete and post-2005 records were selected. 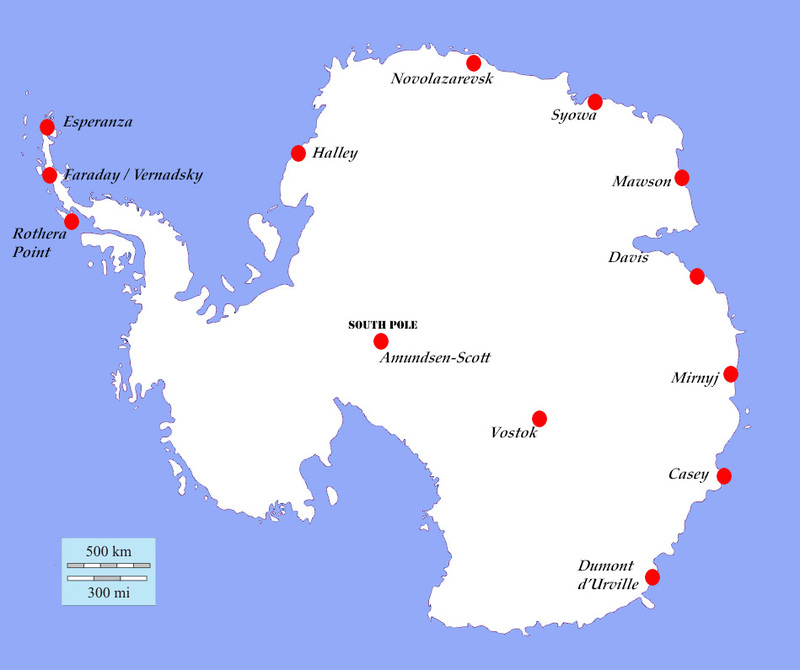 Eleven of the stations are located in coastal areas of the continent and of these three are located on the more northerly Antarctic Peninsula (south of South America). Two stations are located at higher, inland locations including one station at the South Pole. The KNMI database has records up to March or April 2015. I have not been able to make any quality checks on the data. It is possible that there have been some changes in station locations and instrumentation over the periods of record, but sudden steps in the data and comparisons with other adjoining stations would be expected to identify any inconsistencies. In addition, the mean monthly temperatures for the warmest and coldest months (based on long-term averages) at each station are plotted. The coldest months (on average) are always July or August while the warmest month (on average) is January (except for the two inland stations that are slightly warmer in December). A polynomial trend line was fitted through each of the sets of data. 1. Apart from at the three stations located on the Antarctic Peninsula, none of the records at the other ten stations show any consistent trend to either increase or decrease significantly over the past 50-70 years. This conclusion applies to both the mean annual and individual monthly temperatures. 2. The three stations located on the Antarctic Peninsula all have increasing temperatures over the past 60-70 years, although there are differences in magnitude. These three stations are definitely inconsistent with the other ten stations and it is possible that they are affected by changing wind patterns, ocean currents and volcanic activity that don't affect the more southerly stations. 3. The effectively zero temperature trends for the main regions of the Antarctic continent are interesting and possibly significant. In most regions of the world there have been a well-defined, but not alarming, increase (of less than 1ºC/century) in mean annual temperature over the past 100-150 years but, for the main land mass of Antarctica, such a trend cannot be identified in the records of the past 50-70 years. So, apart perhaps on the Antarctic Peninsula, the white continent can be expected to stay white for a long time in the future! * Operation of the Faraday station was transferred from UK to Ukraine in 1996 and it was renamed as Vernadsky station. This article was written by Brian Gunter of Narooma, NSW. In his previous life Brian was an engineering hydrologist involved over many years in the analysis of rainfall and river flow data for the planning of water resources projects in Australia, Asia and Africa. In recent years he has been one of the Marine Rescue NSW (previously Royal Volunteer Coastal Patrol) volunteer weather observers who operate the Narooma station for the Bureau of Meteorology.